Following the suicide of Adolf Hitler on 30th April 1945, Grand Admiral Donitz briefly became President of the Third Reich. He travelled to General Eisenhower’s HQ in France, where he accepted an unconditional surrender on 7th May. He later addressed a large crowd from outside the Ministry of Health, whilst King George V1 and the Queen appeared on the balcony of Buckingham Palace. 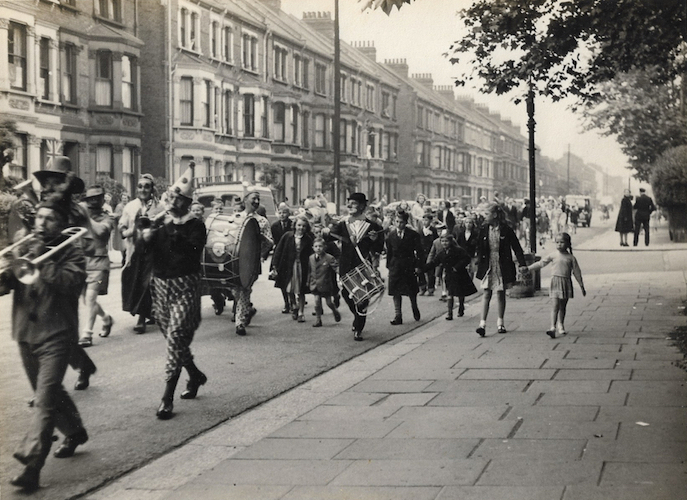 Some went to church to give thanks, street parties were organised, fancy dress parades were held and pubs drunk dry. Effigies of Nazi leaders were burnt, flags displayed and various London landmarks were floodlit (including the Palace, Houses of Parliament, Piccadilly Circus and Trafalgar Square etc). War effectively ended three months later on 14th August when Japan surrendered to the Allies.